Product prices and availability are accurate as of 2019-04-10 23:37:46 UTC and are subject to change. Any price and availability information displayed on http://www.amazon.com/ at the time of purchase will apply to the purchase of this product. 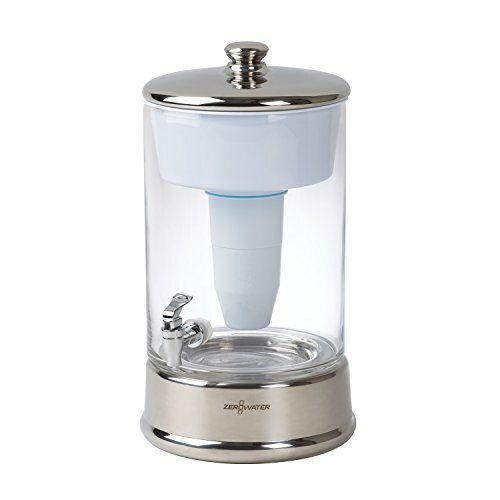 "ZeroWater's 40 Cup Ready-Pour Glass Dispenser delivers elegance and function. The largest capacity filtered device on the market features Ready-Pour technology; allowing you to dispense filtered water as the reservoir continues to filter. The 40 Cup Glass Dispenser is perfect for holiday parties, baby showers, outdoor events and commercial use with the no drip, easy pour spigot. The 5-stage filter transforms your tap water into delicious, TDS-free drinking water. All ZeroWater products include a free Water Quality Meter to test your water to ensure the highest quality filtration on the market. Get more out of your water with ZeroWater's 5- Stage Water Filtration. 40 CUP READY-POUR: With an elegant glass tank and no-drip spigot, ZeroWater's 40 cup ready-pour filtered water dispenser is great for gatherings, offices, or home use. Pour a glass of filtered, clean tasting water while the reservoir continues to filter. FIVE STAGE WATER FILTRATION: Unlike many water filters & pitchers, ZeroWater filters use 5 stages of filtration, to bring you cleaner, better tasting water. Instead of carbon filtering only, our filters use Ion Exchange Technology to reduce contaminants. NOT AN ORDINARY WATER FILTER: ZeroWater filters filter water in 5 stages, are NSF certified to reduce lead and other heavy metals. Zerowater removes 99.6% of total dissolved solids, 2X more than the leading brand (tested by independent lab). GET MORE OUT OF YOUR WATER: Remove more impurities from your water with ZeroWater's unique, 5 stage filter system. With a variety of options, you can have cleaner water anywhere, from pitchers, bottle filtration systems, or portable on-the-go cup filters. ZEROWATER QUALITY: Some ZeroWater filters are compatible with other brands of water pitchers. Try switching to ZeroWater if you have used water filters or pitchers from Brita, Pur, Aquagear, Nakii, Waterdrop, Kenmore, Berkey, Fridgidaire, or Aquasana.